Most people don’t cycle, and it’s easy to assume they’re indifferent, even hostile to cycling. But that’s not true; even as they describe, explain and justify their car-locked lives, many people view cycling as something they’d love to do, just not in this world. When people talk about driving and cycling they often talk about two quite different and separate worlds. There’s the world they know best, full of cars including theirs, the world they must – simply to function – learn, accept and deal with. This world is physical and psychological, ‘out there’ but also ‘in here’, and so taken-for-granted it’s negotiated almost without thinking. Bicycles occupy another world – slower-moving and sunnier, if confined in most people’s imaginations to leisure, holidays and wishful thinking. People struggle to fit the idea of themselves cycling into the first world, but easily can in the second. So interviews about cars and bicycles tend to slip between describing everyday car-based hustle and bustle and reflecting on the occasional or imagined delights of, for example, a weekend off-road ride in the countryside. Other surveys show people want 20 mph speed limits, and want cycling (and walking) prioritised over the car. That people want change is unsurprising – the car system structures their world and many are forced against their deepest desires and aspirations to drive. In a sensible discussion I’m sure almost everyone would agree Britain’s being choked by cars and wishes it could stop. Utility cycling remains a remote but real possibility despite the twin, related processes of people feeling disempowered from doing it and urban space practically eliminating it; people are dreaming even now, even here, among all the cars, of being in a better, happier place, by bike. Change from cars to bicycles is closer than we think; it just needs to be triggered, if not in the ways we’re trying to trigger it. The biggest barrier is not lack of desire, it’s cynicism – dreaming of a cycling future’s one thing, getting there quite another; why get excited about something you can’t imagine happening? People glimpse a better cycling future, but remain in perpetual fug over the driving present. The car contributes to a de-skilling and disembodiment of everyday life. People’s capacity to move through the world without a screen to protect them has been eroded, as has the relationship to their own bodies that develops through physical activity. Talking to people about their reliance on the car, you get the impression we’ve collectively sleep-walked into the current state of transport, and on pausing to think about it they momentarily awaken and slowly shake their heads, struggling to comprehend how the car’s taken over life. Even the most car-centric of people feels this; Jeremy Clarkson’s tremendous popularity is surely based on his ability temporarily to extinguish people’s growing ambivalence towards the car, so they can still sometimes bathe for a short sweet while in its unalloyed celebration. So cycling sits in an alternative future even as current conditions occlude it. Cycling here is importantly symbolic. If in the present people have lost control of their bodies, homes and lives, in the cycling future they retake control of those bodies, take back those homes from the car, and reassert autonomy over those lives. The thought of cycling gives people a sense that things, and most importantly they themselves, could be different. Cycling’s power is as the pivot around which life rotates away from a darker towards a brighter future. But it’s unwise to show unambiguous support for something with such dodgy prospects, so enthusiasm for cycling is muted, constrained by the understandable (if also incorrect) sense that ‘things don’t change – driving’s what we do’. For now, people figure, we’re stuck with the car. You might think this other world lying just beneath the cars is so clearly against vested interests, it’ll never happen. 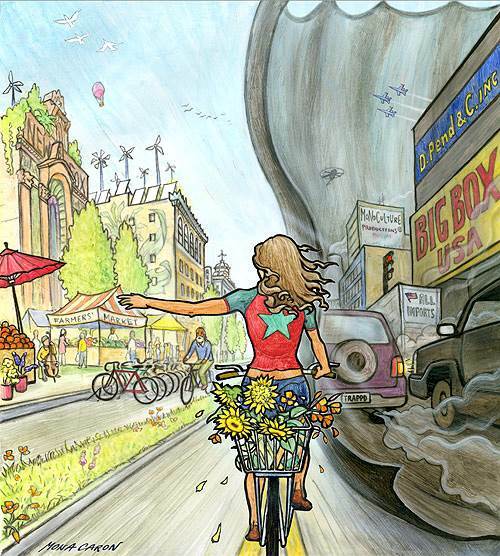 You might say it’s much easier for car-dependent people to romanticise cycling than it is to get them on a bike. But don’t those responses keep cynicism the biggest barrier to cycling? I think we should see the truth in people’s hesitant, halting visions of a better life, and make ways to encourage and convert them into action, though precisely how we do so is another question. Another world is possible, and cycling is not just part of it, it’s a route to it. Cycling is repressed but barely; it lies close to the surface. This is why, as I tried to say in a recent post, I think we need to create more seductive visions of the cycling future, to help people get more than a glimpse – to help them get a sustained view – of the world that cycling, including their own cycling, will create. Stradling, Stephen, Jillian Anable, Tracy Anderson and Alexandra Cronberg (2008): ‘Car Use and Climate Change: Do We Practise What We Preach?’, in Alison Park, John Curtice, Katarina Thomson, Miranda Phillips, Mark Johnson and Elizabeth Clery (eds), British Social Attitudes: The 24th Report, London: Sage, pp. 139-59. After Another Cyclist Dies, David Cameron Considers Truck Ban in UK Cities | Streetsblog USA on Understanding cycling …? My name is Dave Horton. This blog describes and explores my own cycling practice, and is also home to my academic work on cycling. Enter your email address to follow Thinking About Cycling, and receive notifications of new posts by email.